In the summer I’ve come to rely on chicken salad as one of my main dishes. One night I’ll make a lot of grilled chicken or baked chicken, or roast a whole chicken, and the next night I use the leftovers to make chicken salad. Then we have the salad for lunch or dinner (or both) the next day. 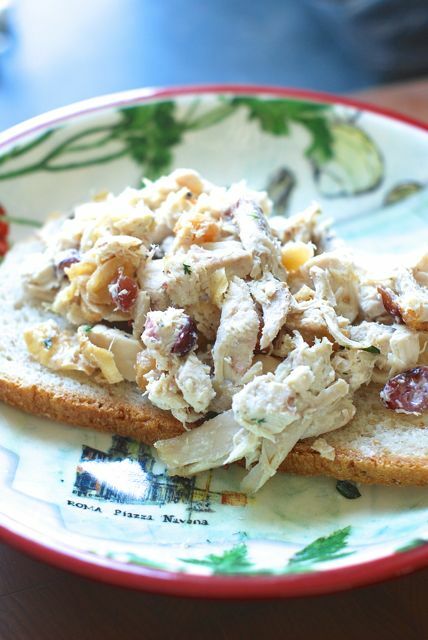 The recipe I use is more of a method, so I call it my 1-2-3 easy chicken salad recipe. It comes together with ease and makes a great dish every single time! I'll make a lot of grilled chicken or baked chicken, and the next night I use the leftovers to make this chicken salad! Step 1: Add the chicken to a large bowl, and mix in the mayonnaise and yogurt until the chicken is evenly coated. Step 2: Add in the salt, pepper, cranberries, and peanuts and stir well. Step 3: Finally, fold in the parsley. Serve on bread! To store the chicken salad, keep it in a covered container or cover the bowl with plastic and keep refrigerated at all times.